We agree, the kitchen is a tough place to organize. It might be small, cramped up and totally cluttered. But according to a lot of home décor enthusiasts and professional interior designers, a beautiful kitchen sets the right tone for your home. A kitchen means so much for different people and its important to know how to organize a kitchen to get the most out of every inch. 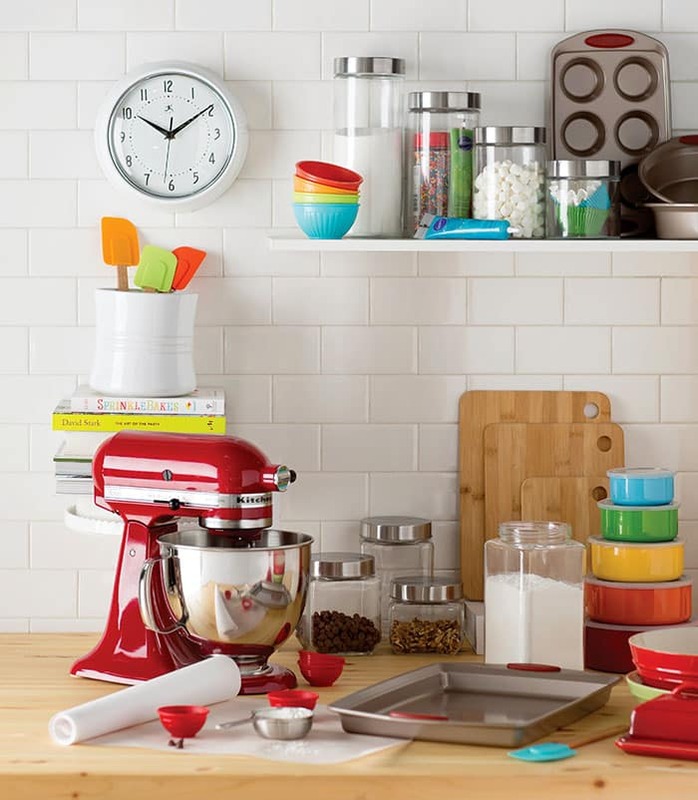 This quick read will help you know how to organize a small kitchen in the most effective way. 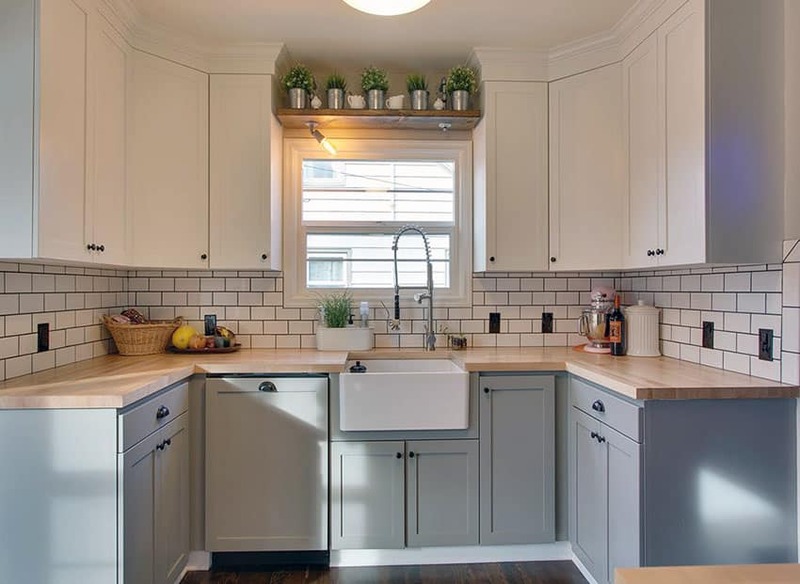 The size of your kitchen doesn’t have to decide how pretty your kitchen looks, that’s because there are so many smart storage ideas you can pick from this article about organizing small kitchens. A little attention and some arrangements here and there is what you need to make a stunning kitchen. 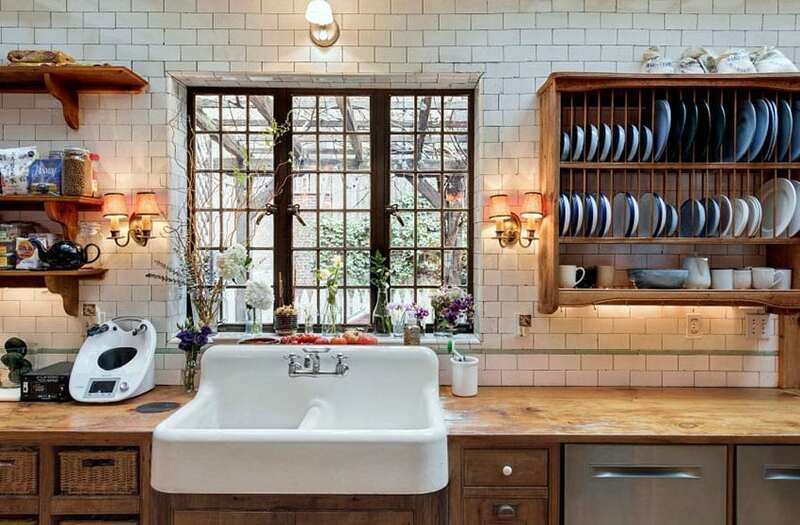 Read on to find some valuable ideas and tips on how to organize your small kitchen. 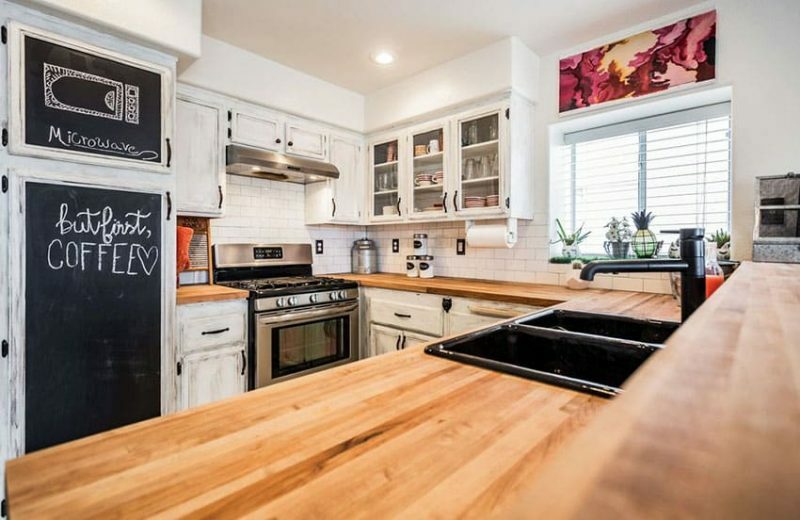 In the picture above this small kitchen with white cabinets gets creative with fun blackboard cabinet doors. Some of the kitchen’s cool design features include plenty of storage space, glass fronted doors, and a light color scheme with light wood countertops, white backsplash and cabinetry. For a small kitchen, it is important to feel light and bright. If your walls are painted in dark colors or if your cabinets are too heavy and old, its time to give it a revamp. White being the most loved color for making your small kitchen look visually more spacious, use it in your kitchen area generously in whichever way possible. Tackle the walls first, paint it in light tones like pastels, off white and cream. Then take time to change your dark and shabby kitchen cabinet doors and shelves to something more lighter in tone, like a light shade of brown. If DIY is your thing, then do not hesitate to run through a few tutorials to paint your cabinet doors in white or some light color to instantly make your small kitchen look more spacious. Also, choosing light colored tiles for your backsplash adds that extra bit of spaciousness to your kitchen. See more DIY small kitchen ideas here. A lot of us like those large cabinets fixed on the wall that takes care of all the kitchen essentials. But did you know, opting for open shelves can be more useful than large cabinets for efficient storage? Especially if making your kitchen look more neat and organized is your goal. 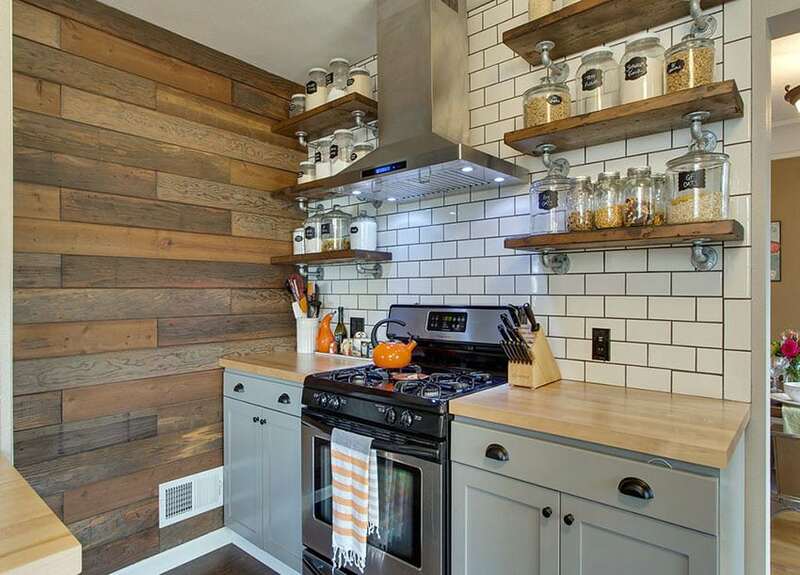 Fixate open shelves one below the other to place your jars and kitchen wares. As an alternative for open shelving in a compact kitchen design is using cabinets with glass doors is also a superb idea in making your kitchen look neat and spacious. Glass cabinet doors gives you space more depth perception making it look bigger. This might seem quite trivial for a lot of people, but solid jars made of plastic and metal is a always a big no-no for small kitchen. The idea of using glass jars and tins for food storage is obviously to make your kitchen cabinet look less crammed. Opting for glass jars that are clear helps you attain that easily. Its not only practically more useful since you can see what it holds without you searching for it but also adds to the décor of your kitchen. Its aesthetically more appealing and helps in clearing the messy look of your wall cabinet. So whether you are storing fewer large jars or a number of smaller ones – glass is the smartest way to organize smaller kitchens. If you do not like bottles of kitchen cleaners and mops lying around your kitchen then its time to push it under the sink, literally! The space under the sink is probably one of the most under-used areas in a kitchen. Attach a tension rod and neatly hang all the spray bottles while the mop and brushes can be kept at the side. For some more space on the wall, think vertical. 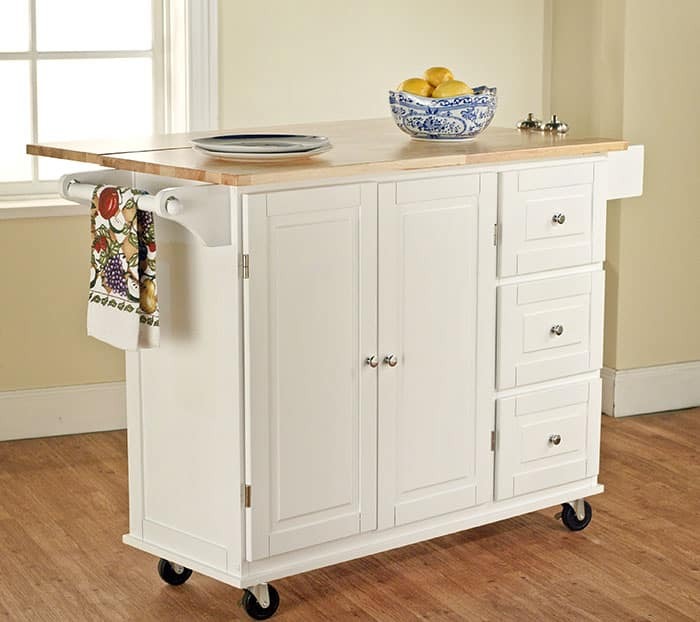 If you’re falling short on storage and ideas to organize your tiny kitchen then take the creative path to storing your kitchen wares. 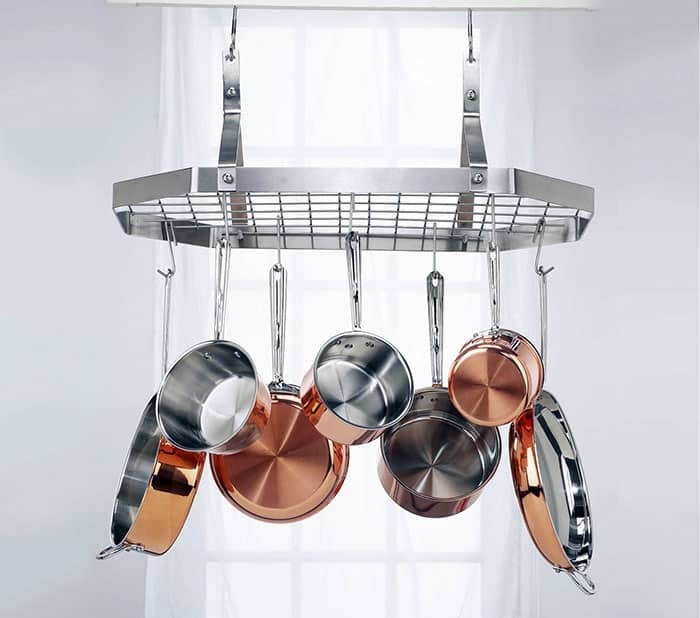 Attach a few hooks on a wooden plank to hang your cups, mugs, saucepans, grill pans, skillets and woks neatly saving on space. 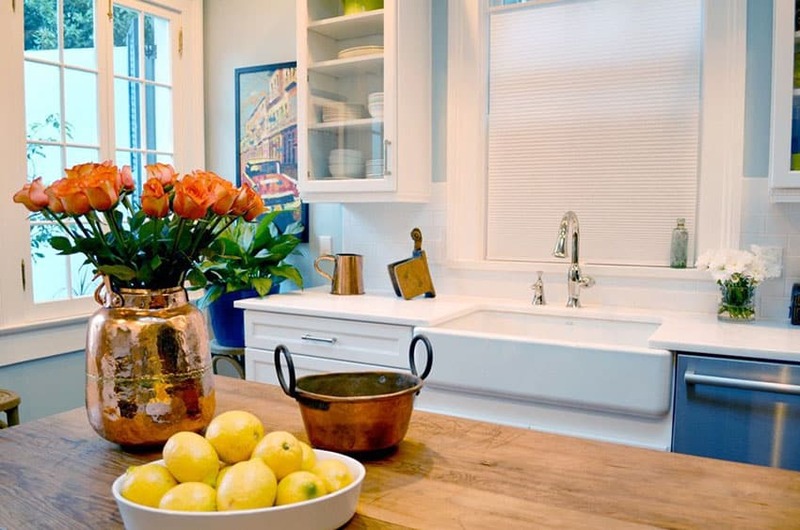 You could also hang baskets on the wall to keep your fruits and other necessary veggies like potatoes and onions handy. This way, they will not be lying on your kitchen top creating a mess. 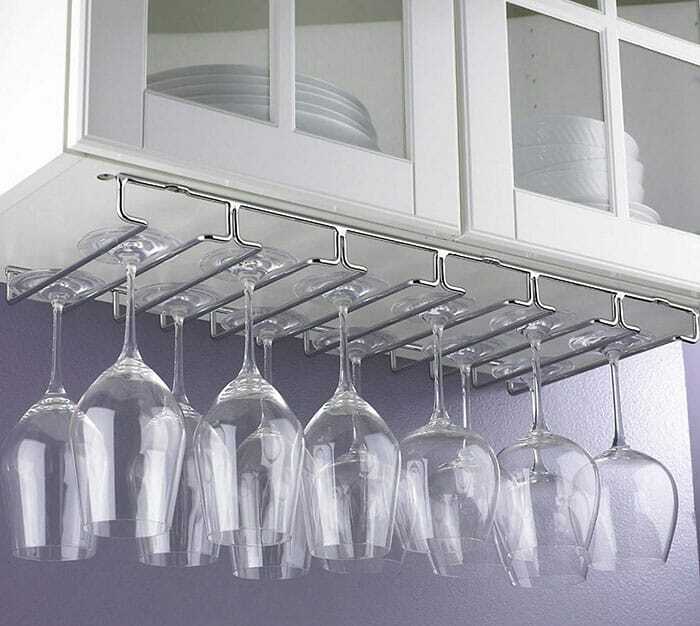 A wine glass rack could also be a great way to store glasses that would otherwise take a lot of cabinet real estate. Finally, one of the best ways to organize a small kitchen is to re-work your kitchen cabinets. If your cabinets are not properly used to their optimum available space make sure you do. After all there is no such thing as ‘too much storage space’. Cabinets that go up higher on the walls may provide extra storage space that would otherwise go to waste. Do be careful when using small kitchens with dark cabinets as darker colors tend to make the space feel more closed in. 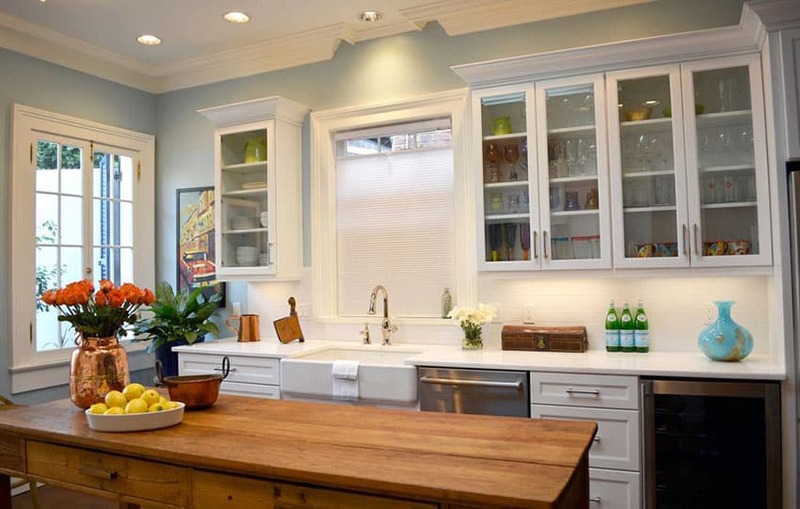 Using lighter color cabinetry and adding plenty of natural light can provide the appearance of a larger space. 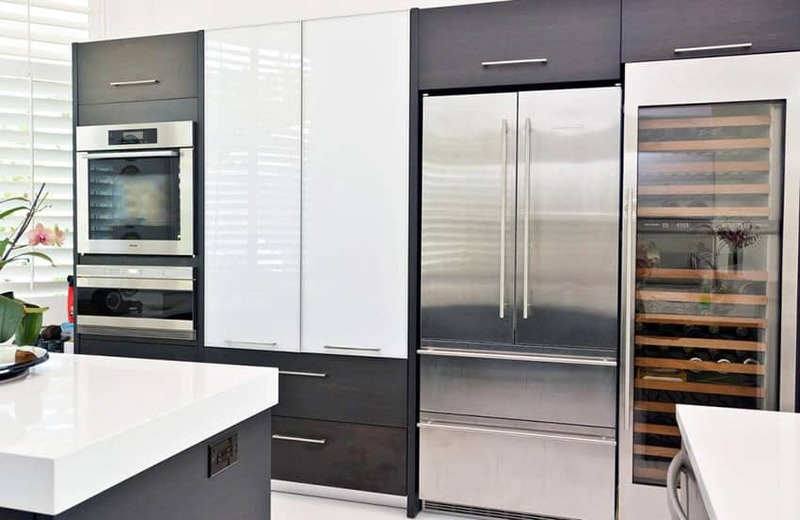 The two tone kitchen cabinets above offer a little of each by lighting up the dark modern cabinets by combining them with a glossy white cabinet. 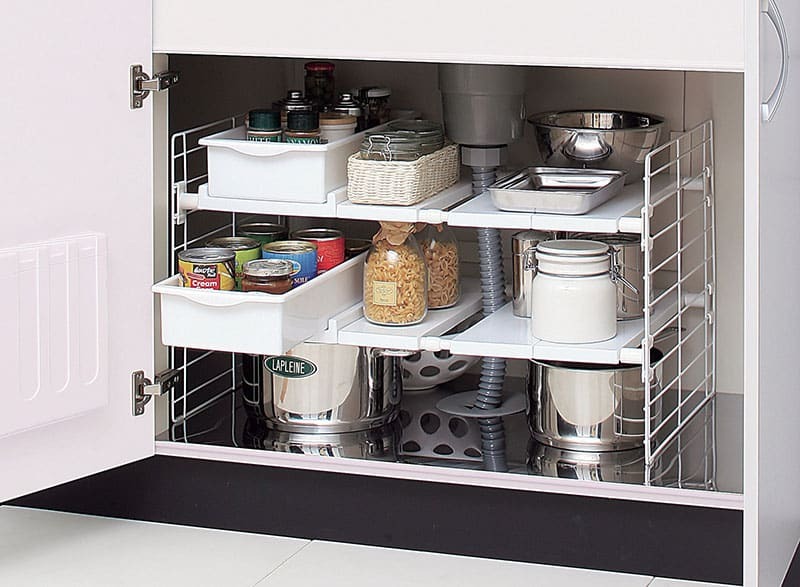 From pull out drawers that are rightly sized for all your kitchen wares to attaching racks on the door for your cans and tins, make sure your cabinets are well used and arranged neatly. Also, do consider using see-through baskets to place all your ready to make food packets, cereals and grains on the side shelf to make it much more accessible and organized. A U-shaped kitchen design is an effective layout for organization. Not only does it facilitate a useful kitchen work triangle the layout helps to group all of the meal prep and cooking activities close together while keeping everything within easy reach. If you love cooking, a kitchen is your area of experimenting with different recipes. For a mother, it is where you lovingly make meals for your family. And for all the bachelors, your kitchen is where you probably even started cooking for the first time. While for all the newbies starting to live on your own in the big city, your little kitchen is where you will make many of your disastrous ‘first time’ dishes. So your kitchen is not just any other space in your home, but a place where you learn, cook, experiment and make so many memories. From your first baking experience to your super professional Italian pasta dish, your kitchen definitely lives through all those special cooking moments you create over the years. And for a place that means so much, you need to put in a little effort in making it look fabulous. If you are one of those worried about a crammed kitchen space with overloaded groceries, overflowing cabinets and cluttered utensils, then you are reading this just in time. 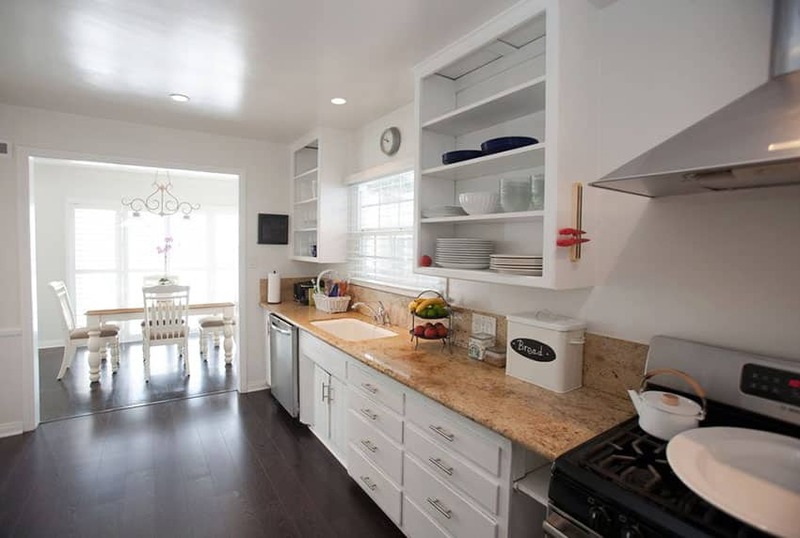 While the first and foremost step is to stop hoarding things that you do not need and purging your kitchen to have only the necessary things, there are many other smart small kitchen ideas to help organize and add more space too.